On the third floor of the Montreal Chest Institute, at McGill University, Olga Kotelko stood before a treadmill in the center of a stuffy room that was filling up with people who had come just for her. They were there to run physical tests, or to extract blood from her earlobe, or just to observe and take notes. Kotelko removed her glasses. She wore white New Balance sneakers and black running tights, and over her silver hair, a plastic crown that held in place a breathing tube. Tanja Taivassalo, a 40-year-old muscle physiologist, adjusted the fit of Kotelko’s stretch-vest. It was wired with electrodes to measure changes in cardiac output — a gauge of the power of her heart. Taivassalo first met Kotelko at last year’s world outdoor masters track championships in Lahti, Finland, the pinnacle of the competitive season for older tracksters. Taivassalo went to watch her dad compete in the marathon. But she could hardly fail to notice the 91-year-old Canadian, bespandexed and elfin, who was knocking off world record after world record. Masters competitions usually begin at 35 years, and include many in their 60s, 70s and 80s (and a few, like Kotelko, in their 90s, and one or two over 100). Of the thousands who descended on Lahti, hundreds were older than 75. And the one getting all the attention was Kotelko. She is considered one of the world’s greatest athletes, holding 23 world records, 17 in her current age category, 90 to 95. In Lahti, watching Kotelko run fast enough that the wind blew her hair back a bit, Taivassalo was awed on a personal level (she’s a runner) and tantalized on a professional one. She hoped to start a database of athletes over 85, testing various physiological parameters. Hepple, who is 44 and still built like the competitive runner he used to be, met Taivassalo at an exercise-physiology conference. She did her Ph.D. on people with mitochondrial disease; he was better acquainted with rats. They married. In the room at McGill, Hepple leaned in to the treadmill, barking encouragement to Kotelko as needed as she jacked her heart rate up beyond 135. In the end, Kotelko’s “maxVO2” score — a strong correlate of cardiovascular endurance — topped out at 15.5. That’s about what you’d expect from a “trained athlete of 91,” if such a type existed. In truth, there is no type. Though when you hear the stories of older senior athletes, a common thread does emerge. While most younger masters athletes were jocks in college if not before, many competitors in the higher brackets — say, older than age 70 — have come to the game late. They weren’t athletes earlier in life because of the demands of career and their own growing families. Only after their duties cleared could they tend that other fire. That’s Kotelko’s story, too. She grew up, with parents of Ukrainian descent, on a farm in Vonda, Saskatchewan, No. 7 of 11 kids. In the morning, after the chickens were fed and the pigs slopped and the cows milked, the brood would trudge two miles to school, stuff a broken old softball with sand or rags and play ball. Kotelko loved the game and played through childhood, but as she got older, the opportunities just weren’t there. As an adult she taught grades 1 through 10 in the one-room schoolhouse in Vonda, married the wrong man young and, realizing her mistake, fled for British Columbia in 1957 with two daughters and brought them up alone, earning her bachelor’s degree at night. Much of her adulthood had run through her fingers before she could even think again about sports. She picked up softball again after retiring from teaching in 1984 — slow-pitch, but pretty competitive. (“We went for blood.”) And then one day when she was 77, a teammate suggested she might enjoy track and field. She hooked up with a local coach, who taught her the basics. She found a trainer — a strict Hungarian woman who seemed as eager to push her as Kotelko was keen to be pushed. Juiced with enthusiasm, Kotelko hit the gym hard, three days a week in season. For up to three hours at a stretch, she performed punishing exercises like planks and roman chairs and bench presses and squats, until her muscles quivered and gassed out. Ken Stone calls her “bulletproof,” and her history even off the track bears the label out. Apart from two visits to give birth to her daughters, she has seen the inside of a hospital once in her life, for a hysterectomy. Kotelko acknowledged her good luck as she put away a big plate of pasta and a glass of red wine one evening, midway through the world indoor championships in Kamloops, British Columbia, this spring. “How old do you feel?” I asked her. The previous day, on a patch of grass tricked out as a javelin field, I watched Kotelko come forward for her turn to throw. Kotelko, who is five feet tall, took the javelin offered by an official with quiet dispatch, like a hockey player accepting a new stick from the bench. There was a bit of a crosswind; it didn’t affect her too much. She picked a cloud to aim at (a tip she first read about in a library book). Ritualistically, she touched the spear tip, rocked on the back foot and let fly, all momentum. It traveled 41 feet. 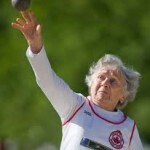 Later, in her favorite event, the hammer throw, Kotelko took her place on the pitch with the other competitors — younger women she competes alongside, though not strictly against, since at this meet she was the only woman in the 90-and-over category. She removed her glasses. She swung the seven-pound cannonball around her head — once, twice, three times — and the thing sailed, landing with a thud, 45.5 feet away. “If I spun I could throw it farther,” she admitted later, but after watching somebody very old fall that way, she has decided not to risk it. Yet if there’s a single trend in the research into exercise and gerontology, it’s that we have underestimated what old folks are capable of, from how high their heart rates can safely climb to how deeply into old age they can exercise with no major health risks. The conundrum for masters athletes — though it seems Kotelko’s great fortune to have largely escaped the phenomenon — is this: Big physiological benefits from exercise are there for the taking. You just have to keep exercising. But you can’t exercise if the body breaks down. To avoid injuries, aging track athletes are often advised to keep to their old routines but to lower the intensity. The best advertisement for that strategy was a race turned in five years ago by a 73-year-old from Ontario. Age-graded, Ed Whitlock’s 2:54 marathon (the equivalent of a 20-year-old running 2:03.57) was the fastest ever run. When people collared him afterward to find out his training secret, they learned that he ran every day, slowly, for hours, around the local cemetery. Kotelko herself speaks often of the perils of getting carried away. “If you undertrain, you might not finish,” she says. “If you overtrain, you might not start.” But there’s some evidence that, in trying to find the sweet spot between staying in race shape and avoiding the medical tent, a lot of seniors athletes aren’t training hard enough — or at least, aren’t training the right way to maximally exploit what their body can still do. Recently, Scott Trappe, director of the Human Performance Laboratory at Ball State University in Muncie, Ind., published a study on weightlessness and exercise in The Journal of Applied Physiology. Using M.R.I. and biopsy data from NASA, he looked at the exercise program of nine astronauts from the International Space Station. In many ways, an astronaut in zero gravity is undergoing an experiment in accelerated aging — muscles atrophy, bone-density declines. That’s what these astronauts were finding too, even though they were using a treadmill, a stationary bike and a resistance machine. Trappe concluded the regime wasn’t nearly hard-core enough. His prescription for NASA: heavier loads and explosive movements. “It’s pretty clear that intensity wins up there,” he says. “And I would predict this to be the case as we age. Part of the challenge is the mind-set or dogma that we need to slow down as we get older.” For example, the belief that aging joints and tendons can’t take real weight-training is dead wrong; real weight-training is what might just save them. Seniors can work out less frequently, Trappe reckons, as long as they really bring it when they do. THE DAY AFTER the treadmill test, Kotelko was ushered into the free-weight gym at McGill University. She lay down at the bench press. Taivassalo was interested in the composition of Kotelko’s muscle fibers. We all have Type 1 muscle (slow-twitch, for endurance) and a couple of varieties of Type 2 (fast-twitch, used for power). Most people are born with roughly half of Type 1 and half of Type 2. Around age 70, fast-twitch muscle begins to stop responding, followed by the decline of slow-twitch a decade later. Power drains away. Trappe calls this the “fast-twitch-fiber problem.” It helps explain the frustration that aging sprinters feel when their times drop off despite their dogged efforts. And no matter how high-tech their exercise program, how strong their will, how good their genes, nobody escapes. Often, the drop-off happens too gradually to notice. But sometimes little moments of perspective pop up. In Kamloops, Kotelko jumped 5.5 feet to trump her own indoor long-jump world record. Afterward, the sexagenarian pentathletes took to the pit. Among them was Philippa (Phil) Raschker, a 63-year-old from Marietta, Ga., legendary on the masters track circuit. Raschker holds, or has held, more than 200 national and world records — sprints, jumps, hurdles. She was competing in nine events in Kamloops. (This despite being pretty much exhausted from working late into the night filing clients’ taxes for days on end. She’s an accountant; it was March.) When I first saw her high jumping, from a distance, I thought she could have been 25. You could see, below her stretch top, the six-pack. But it wasn’t how Raschker looked that arrested; it was the way she moved. Raschker Fosbury-flopped over the bar like water pouring from a jug. The flop allows you to jump higher than other methods do because your center of gravity never actually clears the bar. But the severe back arch demands a suppleness that’s alien to the aging body, which is why pretty much no one over 65 does it. Kotelko was already too old to flop when she took up track at age 77. Instead, she sort of bestrides the bar. Her world record of 2.7 feet is just a little higher than the superfoamy mat. Overall, Kotelko’s high jump gives the impression of someone taking a run at a hotel-room bed. The difference between the world’s greatest 60-year-old and the world’s greatest 90-year-old was clear. On view was the march of “sarcopenia” — the loss of muscle, the theft of that once-explosive power that makes the very old seem subject to a different set of physical laws. It is irresistible to think of Olga Kotelko and Phil Raschker as twins separated by time. Except that Raschker has the potential advantage of a much earlier head start on the track. Given all that extra compounding interest, might she in 30 years become a kind of super-Olga? “Hard to say,” Hepple says. “She’s obviously at a point that precedes many of the big changes that usually happen. And we don’t know how resistant she is — and that resistance is something we do think sets Olga apart.” Those extra decades of pounding might break Raschker down or burn her out. Motivation may ultimately be the issue. Finding reasons to keep exercising is a universal challenge. Even rats seem to bristle, eventually, at voluntary exercise, studies suggest. 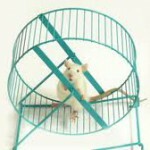 Young rats seem intrinsically driven to run on the wheels you put in their cages. But one day those wheels just stop turning. The aging athlete must manufacture strategies to keep pushing in the face of plenty of perfectly rational reasons not to: things hurt, you’ve achieved a lot of your goals and the friends you used to do it for and with are disappearing. But competition can spur people on. “Maintaining your own records in the face of your supposed decline, providing evidence that you’re delaying the effects of aging — these are strong motives,” says Bradley Young, a kinesiology and sports psychology professor at the University of Ottawa. Young studies the factors that make track athletes want to continue competing into old age. A big one is training partners and family — both the encouragement they offer, and the guilt you’d feel letting them down if you quit. But the strongest motivating driver, Young found, was one’s spouse. In this way, too, Kotelko is unique. She has no husband, and though she does have some family — her daughter Lynda and son-in-law Richard, with whom she lives in Vancouver — they are not involved in her training. IN ONE OF HER last duties to science on the Montreal trip, Kotelko lay serenely, under local anesthetic, on an examining table in the storied Montreal Neurological Institute, where Wilder Penfield mapped the human brain. “Contract your thigh muscle, please,” Dr. José Morais said. The muscle shrugged up visibly when she tensed. The doctor began to draw out a little plug of tissue with a gleaming silver instrument that looked a bit like a wine corker. The sample would be frozen, and the fibers would later be examined. Hepple, in Kotelko’s tissue sample, would be looking for the little angular muscle fibers that typically stop working as people age because they have come unplugged from the motor neurons, nerve cells that tell them to fire. Many researchers assume the problem is within the muscle cells. Hepple disagrees. He says those neighboring motor neurons aren’t activating the muscle as they should, and he speculated that more of Kotelko’s would be functioning properly. Ideally, these two scientists would like to run a sample through genetic testing. Perhaps there are clues in Kotelko’s genome that will help explain the thing that is so singular about her — not speed or power or prowess in any one event, but the resilience to endure all the stress of hard physical activity, year after year, without a hint of breakdown, and no end to the pattern in sight. “There could be a lot we find out in that biopsy,” Taivassalo said, “that tells us what to ask next.” Taivassalo intends to put together a larger sample size, at least 20 or 30 subjects, all old athletes. At that point the information starts becoming statistically significant, and patterns emerge. If the prospect of 30 more nominal Olgas spraying data points into unmapped space is enough to set the hearts of gerontologists aflutter, to Kotelko, the idea that there may be, somewhere, even one more older track star — a genuine rival — is tantalizing. She yearns, she insists, with semiplausible conviction, to be pushed. There’d be no talk of low-hanging fruit and meaningless medals if there were someone she could race close and beat in real time. “I’d love that,” she told me more than once. She may get her wish. Mitsu Morita, an 88-year-old from Japan, is faster than Kotelko was at that age and is breaking all of Kotelko’s records in that age bracket. A Nike ad featuring Morita made her a minor phenomenon in Japan; there are clips of her orbiting the track, followed by laughing teenagers trying to keep up. In the 200, Morita’s world-record time is almost 10 seconds faster than Kotelko’s time in the 90-to-95 category. She claims she gets her strength from eating eel. Morita is not a big traveler. If she can be persuaded to come to America for the world outdoor championships in Sacramento next summer, Kotelko will have her hands full. In October, the first of Kotelko’s muscle samples came back from the lab. The results were compelling. In a muscle sample of a person over the age of 65, you would expect to see at least a couple of fibers with some mitochondrial defects. But in around 400 muscle fibers examined, Taivassalo said, “we didn’t see a single fiber that had any evidence” of mitochondrial decay. “It’s remarkable,” she added. Presumably, at least some of the interventions that emerge will help mimic, for ordinary people entering their very old years, if not exactly Kotelko’s performance on the track, at least something approaching the quality of her life. This is the other story of the future of aging. When the efforts of medical science converge to simply prolong existence, you envision Updike’s golfer Farrell, poking his way “down the sloping dogleg of decrepitude.” But scientists like Taivassalo and Hepple have a different goal, and exercise — elixir not so much of extended life as extended youthfulness — may be the key to reaching it. James Fries, an emeritus professor at Stanford School of Medicine, coined the working buzz phrase: “compression of morbidity.” You simply erase chronic illness and infirmity from the first, say, 95 percent of your life. “So you’re healthy, healthy, healthy, and then at some point you kick the bucket,” Tarnopolsky says. “It’s like the Neil Young song: better to burn out than to rust.” You get a normal life span, but in Olga years. Who wouldn’t take it?